It was a great game. All my friends loved it. But all my friends were engineers. The beer drinkers in the bars were baffled by it. WarGames was a seminal video game movie from 1983 that helped solidify the public’s view of hackers and computer nerds, as well as introduced an entire generation to the idea of networked communities and connected computers, albeit connected by a blazing fast 300 baud dial-up modem. You can read more about the history of WarGames and two other classic early 80’s video game movies here on The Dot Eaters. In that article, I mention an atrocious direct-to-DVD sequel mounted by MGM in 2008 called WarGames: The Dead Code, released to dovetail with the 25th anniversary of the original. Currently in development, and hopefully with better prospects, is another WarGames sequel from MGM. Recently, the writer for the project has been named, one Noah Oppenheim. He is an unknown commodity in feature films, with TV producer credits on The Today Show and Hardball with Chris Matthews, as well as a few reality series. Recently, though, Oppenheim has been swept up in a recent mania over famous escape-artist and psychic debunker Harry Houdini, as the planned writer of The Secret Life of Houdini, which will add the fictional ‘secret spy’ to Houdini’s list of accomplishments. Oppenheim has also been pegged as the writer of the adaptation of a young-adult book called The Maze Runner. Coming in to the WarGames project with a slightly more solid film background is Seth Gordon, previously named as director. Gordon’s latest outing was Horrible Bosses, released this year and garnering a 69% Fresh rating on Rotten Tomatoes. What might make Gordon the best man to helm a project updating a classic video game movie is his work directing, shooting and editing The King of Kong: A Fistful of Quarters, a wonderful documentary that detailed one man’s attempt to wrest the all-time Donkey Kong high-score crown from the flamboyant Billy Mitchell. With King of Kong on his CV, it gives one hope that Gordon and his crew will show the classic WarGames the loving treatment it deserves in an updated sequel. This entry was posted in wargames on August 23, 2011 by William Hunter. Submitted for approval, two new video game ad images for the gallery. 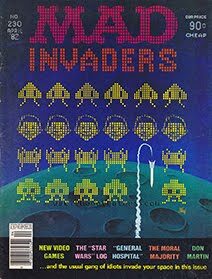 One isn’t exactly an ad, but an homage to Space Invaders and the impact it had on society in the form of a Mad Magazine cover. The video games related article inside imagines games based on real life, such as “The Maddening ‘Subway Rush Hour’ Game where you try to stuff as many people as you can into a NYC subway train, and “The Nauseating ‘Big City Doggie-Do’ Game”, where you try to cross the street without stepping into a pile. Yeech! The second entry is a colourful ad for two TRON video games for the Atari 2600. 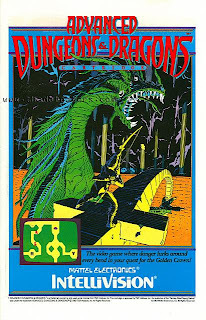 Both TRON Deadly Discs and Adventures of TRON were released for the system by Mattel through their M Network label, which the company used to publish games on platforms outside of their own Intellivision console. 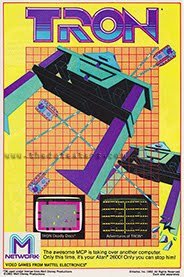 For more info on the TRON movie and the games licensed from it, consult your local Dot Eaters article here. This entry was posted in gallery, mad magazine, Tron on August 17, 2011 by William Hunter. 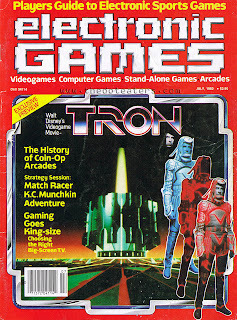 Today this surfaces in the Cortex: a scan of the July, 1982 cover of Electronic Games magazine. EG was the premiere video game magazine of its time. I remember strolling into the drug store with my mom and spotting the second issue of EG on the rack in 1981. It bothered me forever more that I missed that first issue. EG was published from 1981 to 1985, the year its name was changed to Computer Entertainment in order weather the big video game crash and focus more on the burgeoning computer game market. EG helped form video game journalism, and its influence lives on through the myriad of print and online coverage of the scene that exist today. The feature story here is, of course, the release of Disney’s video game extravaganza TRON, which promised to transport the audience into the inner-world of these new fangled computer boxes. The hype for TRON was pretty intense, and helped seal the fate of the movie as a curious social artifact when ticket sales were considerably less than expected. The movie itself is fun, but muddled and disjointed. You can read the history of it, and two other seminal video game films from the early 80’s, in my TDE article here. EG was also the reason I stubbornly always called them “videogames”, before Google’s search algorithm convinced me the combined term never caught on, and would punish me in search rankings if I used it. This entry was posted in electronic games, Tron, visual cortex on August 17, 2011 by William Hunter. I’d like to announce a new feature to the site, a repository of vintage video game ads. I’m just ramping up the entries, so bear with me as the collection expands. You can visit the gallery through a link on the main navigation bar, or simply click here. I’d like to thank Chadwick Gendron of Valhalla Cards and Gifts for his help in getting the gallery up and running with some great scans he made from his impressive comic collection. This entry was posted in gallery, tde on August 2, 2011 by William Hunter. BAM! The Wizard of Wor is hit! POW! The following is a TV commercial for CBS Video Games. Dating from 1982, it purports to show clips from what is called “Challenge of Champions“, a head-to-head competition hosted by longtime football commentator John Madden. It featured one of the company’s latest wares, “Wizard of Wor”, a home adaptation of the popular arcade game from Midway, released in 1980. In fact, the clips are a dramatization of the competition. It’s not even clear if the match had an audience, although I like the American Idol set and Madden’s fevered pitch. Madden, of course, would go on to put his name on something a bit longer lasting than CBS VIdeo Games: EA’s preennial Madden Football series. The first, John Madden Football, was released in 1988. Clip courtesy of The Museum of Classic Chicago Television. This entry was posted in cbs, commerial, football, madden, tv, wizard of wor on August 2, 2011 by William Hunter.